High profile drug overdoses always bring the spotlight onto forensic toxicology, with newspapers and TV waiting on the details of what drugs have been taken. I talked briefly about the processes that occur in forensic toxicology in the blog post ‘Awaiting the results of toxicology testing‘, have a read for a bit of background. The photo above shows the actor Philip Seymour Hoffman (PSH) in one of my favourite films, The Big Lebowski. He played the part of Brandt, the executive assistant to Mr Jeffrey Lebowski, alongside co star Jeff Bridges, the Dude, the other Jeffrey Lebowski. Early in February PSH died from an overdose in his New York apartment. At the time of his death it was said he was found with a needle in his arm. Immediately this makes me think heroin is involved in the death. Indeed almost immediately rumours spread that he had used a type of heroin laced with the synthetic opioid fentanyl, which is reported to have caused the death of many in the US recently. Fentanyl is a very potent opiode when compared with morphine, with approximately 1 100th of the dose required to produce the same effects. Therefor a small amount of fentanyl mixed in with heroin (diacetylmorphine, which is metabolised to morphine amongst others) would vastly increase the potency. 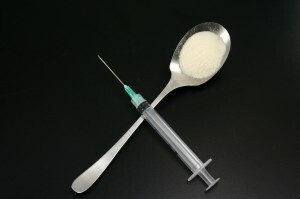 The police have stated that it was not this type of heroin found, no fentanyl was present. The toxicology reports haven’t been publicly released in full (that I could find anyway) but the outline of the results has been shared. In many of the reports in news items I have seen the results are not very clearly explained. If I can get hold of more I’ll let you know, but for now I’ll go on major news items! It has been reported that he had in his system a mix of “heroin, cocaine, amphetamines and benzodiazepines” (quoted directly from The Guardian, same phrasing used in the Huffington Post edit: and now confirmed above). Speculation is that he may have injected a ‘speedball’, a mixture of cocaine and heroin was apparently the cause of death of the actor River Pheonix. This isn’t as common in the UK (I saw a few cases with both drugs involved) as in the US and still less so in NZ where neither heroin nor cocaine are major drugs of abuse. Looking at those reported results there are a couple of things that draw my attention. Firstly neither benzodiazepines nor amphetamines are a single drug, rather classes of related drugs. Benzos are prescribed for a variety of things: sleeping disorders, anxiety, seizures and as muscle relaxants. They were developed in the 1960s to replace barbiturate drugs and the class would encompass 30-40 different drugs available now. Diazepam (trade name Valium) is the most well known and was an early development. Amphetamines on the other hand are mostly illegal drugs which have a stimulant effect. Amphetamine is one example of amphetamines, so are methamphetamine and ecstasy (methylenedioxymethamphetamine, MDMA). When a report does not detail which was present it is hard to know whether they have just reported the results of a screening test or if full confirmatory analysis was completed but they wanted to keep the detail hidden. A screening method may be immunoassay based, which would tell us what type of drug was present but not specifically which. I would hope that the actual drug has been determined, generally this will require a mass spectrometric method for detection, such as gas or liquid chromatography couple to mass spec. Secondly they report cocaine in the blood, along with heroin. Are these the parent compounds or metabolites. More detail of what compounds were detcted could help establish a timeframe since the drugs were used. If no parent cocaine was found it would likely be the metabolite benzoylecgonine, which may indicate use a few hours ago rather than the concurrent use of heroin and cocaine. Was it the usual marker of heroin 6-MAM that was detected? That would indicate fairly rapid death (as also evidenced perhaps by needle in arm) or a further metabolite. Until the complete blood levels and details emerge it is hard to give much more certainty around the cause. The effects of benzos plus heroin (both CNS depressants) may actually be more relevant than the cocaine and amphetamine findings. Was he prescribed any benzos or amphetamine type drugs (some cross reaction with the immunoassay may occur with some prescription drugs)? Was he seeking treatment for his reported addictions? I was just talking to students today about this and explained that the tox does not occur in a vacuum, you need to have as much relevant information available to you as possible to give a more accurate cause of death, such as the scene details of medications found, prior medical history and any features detected at post mortem examination. Thanks for reading – please share and sign up for updates or like our Facebook site! Looking at the first part of your blog and the early rumours around his death, it is incredible to think that there is heroin circulating laced with fentanyl, isn’t it. Surely this is a dicey path for any drug user? To think that there can be any financial gain for the supplier is difficult to imagine too, although some users will pay the elevated price. Even experienced or ‘intelligent’ users must surely think twice. There again, maybe it is circulating to meet only one specific and very terminal need. Another sad story. But for us, something very useable for the students! So many stories of acute mixed drug intoxication these days. Explaining the metabolism and toxicology of one is difficult enough!